Last week, I "fathomed" Mozart's jocular drama, the "opera of all operas." Allow me to explain (it's actually all fun and games). I had the opportunity to create and host a trivia contest on Facebook with each winner receiving a pair of tickets to the Metropolitan Opera's summer encore of Don Giovanni in cinemas on June 27, 2012. This was the result of my collaboration with...(boom, boom, crash! )...Fathom Events! Creating 20 trivia questions about the opera was a slight challenge considering that I wanted to keep them interesting and engaging for every type of Mozartian who subscribes to The Chronicles, and trust me, they're of a great variety! Watch the cast interview. While facilitating the contest was mainly about creating access to the opera via this cinematic platform, it was also a valuable experience for me as I learned more about those who share my passion for Mozart and support my stewardship. I mentioned this in the recent Tyson Vick interview and I'll mention it again: it's all about people and preservation! It's particularly exciting for me to know that many of my contest winners will not only be experiencing opera in cinema for the first time, but Don Giovanni as well. Many of them love Mozart and opera generally, but don't have access to performances where they live. Most of their exposure to opera has been through recordings and random viewings on PBS, not a steady diet of live performances and DVDs. On the opposite end of the spectrum, a few music professionals also won tickets, including an orchestra conductor, singer and opera company founder, who have all experienced opera many times, including performances at the Met and via cinema. Winners hailed from eight different states: Arizona, Connecticut, Florida, Illinois, New Jersey, New York, Ohio and Tennessee. I loved the diversity of this participation and the energy it brought to the contest. A few of my winners were teenagers, one in particular, who's excitement and enthusiasm for the screening was so palpable that it was especially rewarding for me. Growing up in a small town without a thriving performing arts scene, I could identify with her depravity and consequent craving to experience this genre. On a day like this, I feel truly justified in what I do and why I do it. The last performance of Don Giovanni I attended was at the Estates Theatre in Prague where Mozart himself conducted the premiere in 1787, so seeing it in the cinema will be a great contrast! (Eating popcorn while watching opera will be liberating!) Although I've attended Mozart operas at the Met in person, this will be my first encounter with The Met: Live in HD and generally viewing a Mozart opera at the cinema, so I'll be sharing in this new experience with my fellow viewers which is very exciting! I've been a strong supporter of opera in cinema since the idea was introduced by the Met's General Manager Peter Gelb. 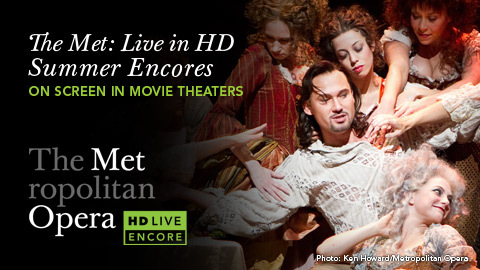 The Met: Live in HD has sold more than ten million tickets since its inception in December 2006. I experienced a live broadcast of the Washington National Opera's La Bohème on my university's campus to the surprising interest and applause of students, so I knew it had staying power and the ability to grab opera's non-traditional audiences. I wrote about the power of cinema's connection to opera in my master's thesis. And now, to realize opera in cinema on a level where I'm actually granting access to it through a self-designed campaign with Fathom Events, it's beyond fulfilling. I hope this medium becomes a permanent part of my approach to advocating Mozart as exciting, accessible and relevant. The Met has three Mozart operas scheduled for the 2012-2013 season and my heart's already sitting on go! Your effort is much in gratitude. BRAVO!! !